Last January I mentioned that I co-authored a paper that appeared on bioRxiv in which we combined tree ring and growth increment data to predict growth from weather and biophysical data. The paper has now appeared in Ecosphere, an open acces journal from the Ecological Society of America. Here’s the abstract. You’ll find the full citation below. Better understanding and prediction of tree growth is important because of the many ecosystem services provided by forests and the uncertainty surrounding how forests will respond to anthropogenic climate change. With the ultimate goal of improving models of forest dynamics, here we construct a statistical model that combines complementary data sources, tree-ring and forest inventory data. A Bayesian hierarchical model was used to gain inference on the effects of many factors on tree growth—individual tree size, climate, biophysical conditions, stand-level competitive environment, tree-level canopy status, and forest management treatments—using both diameter at breast height (dbh) and tree-ring data. The model consists of two multiple regression models, one each for the two data sources, linked via a constant of proportionality between coefficients that are found in parallel in the two regressions. This model was applied to a data set of ~130 increment cores and ~500 repeat measurements of dbh at a single site in the Jemez Mountains of north-central New Mexico, USA. The tree-ring data serve as the only source of information on how annual growth responds to climate variation, whereas both data types inform non-climatic effects on growth. Inferences from the model included positive effects on growth of seasonal precipitation, wetness index, and height ratio, and negative effects of dbh, seasonal temperature, southerly aspect and radiation, and plot basal area. 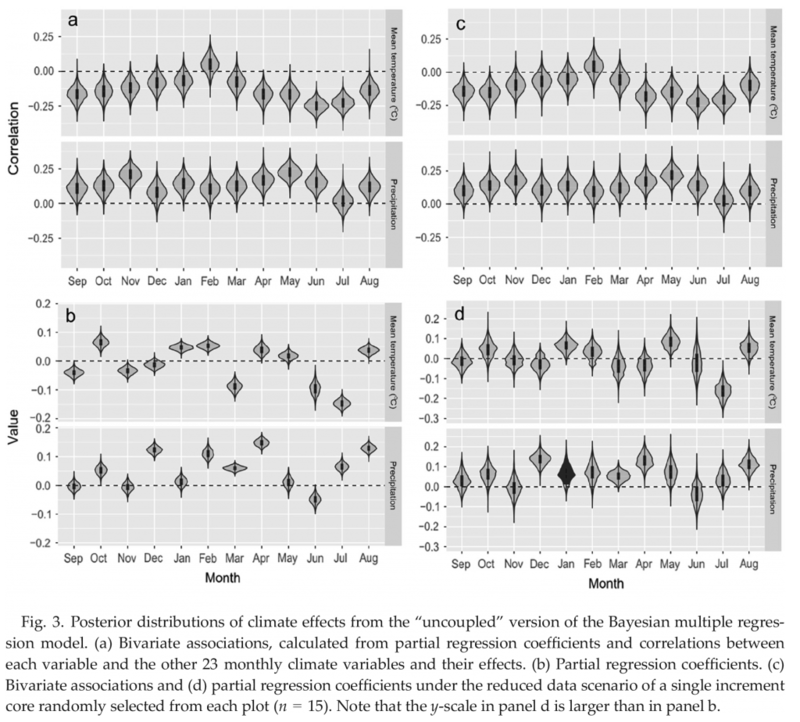 Climatic effects inferred by the model were confirmed by a dendroclimatic analysis. Combining the two data sources substantially reduced uncertainty about non-climate fixed effects on radial increments. This demonstrates that forest inventory data measured on many trees, combined with tree-ring data developed for a small number of trees, can be used to quantify and parse multiple influences on absolute tree growth. We highlight the kinds of research questions that can be addressed by combining the high-resolution information on climate effects contained in tree rings with the rich tree- and stand-level information found in forest inventories, including projection of tree growth under future climate scenarios, carbon accounting, and investigation of management actions aimed at increasing forest resilience.